Serving householders in Greater London and the Home Counties. Home County Shutters is your friendly choice for advice, design and installation of your new window shutters. There are many reasons why you might be looking for shutters for your home. We’ll try to give you some ideas on these pages. When you’re ready, we’d be delighted to visit you at your property to listen to what you want, discuss your options and advise on design and construction. If you’re looking for personal service and you like to buy products with a strong guarantee, you’ll be glad you visited Home County Shutters today! Your house sometimes doesn’t feel like your home when other people can see right into your living room. Carefully chosen shutter designs give prying eyes or nosey neighbours something else to look at! Shutters can be a discreet and effective way to ensure your privacy at home. Where curtains give you the option to shut out the sunlight – or not – shutters can give you the best of both worlds, offering degrees of shade. This lets you take advantage of the natural daylight available for your room, instead of closing it out altogether. Bitter cold and draughty windows can make for an uncomfortable experience in the winter. When it’s not practical to replace your windows, it might be worth considering the use of shutters to help keep the cold out. After all, your shutters will add another layer of protection between you and the elements! Busy city locations often mean intrusive traffic noise for householders. Properly designed and fitted shutters can help to reduce noise from the outside from spoiling your enjoyment of your home. You can use new shutters to add character and style to a room. Even in those awkward little places you thought you couldn’t do anything with! Let us show you what you might be able to achieve with carefully designed shutters. You might be in for a pleasant surprise. Beautifully designed and professionally installed shutters can help you feel more comfortable in your home. Because that’s what matters isn’t it? You, your home and your enjoyment of living in it. Plantation shutters as home improvement. Let us show you what you can achieve. 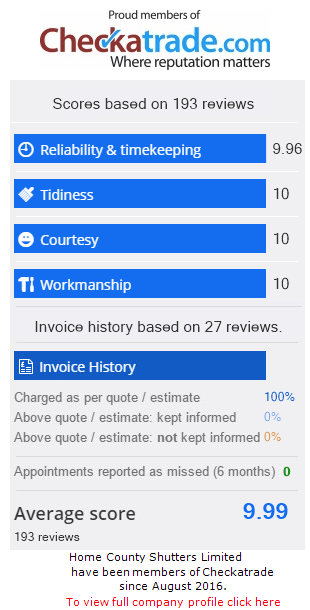 We work hard to maintain our reputation as an installer people like to do business with. However don’t take our word for it – see what our customers think! Check our reputation on Checkatrade and our own Facebook page.